The military potential of air craft was recognised even before the beginning of World War I. The earliest idea was that aircraft would merely support armies by performing the reconnaissance duties that were once the preserve of cavalry. During World War I it quickly became apparent that bombing enemy troops and destroying enemy reconnaissance aircraft would also be important roles for aircraft. Therefore, in the five years of World War I the planes of all the combatant nations developed at a remarkable rate from flimsy, slow moving sluggish things with small engines and little or no load capacity or armament to dedicated, manoeuvrable and rugged killing machines designed specifically for combat from the air. World War I saw an aerial arms race between the two sides. It was a race in which Britain often found itself lagging behind German ingenuity and development. Such lags in development led to the British Royal Flying Corps (RFC) suffering severe casualties during the Fokker scourge of late 1915/early 1916 and Bloody April 1917. By 1918, however, British plane designs, such a the Sopwith Camel, SE5a and Bristol Fighter, were finally on a par with the latest German designs and in some cases even superior. After World War I Britain continued to be at the forefront of military aircraft design although by the mid 1930’s a rapidly re-arming Germany had once again taken the lead. 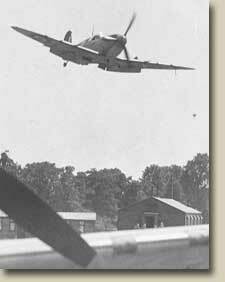 It was a lead that Britain would only just close before the beginning of World War II with the timely introduction of the legendary Spitfire and the barely less famous Hurricane. The Spitfire in particular must stand as one of the greatest aircraft ever to have taken to the sky.